When sizing your dog it is important to note: The Co-Leash will get several inches larger but does not get smaller than the size shown. For example, if your dog has a 17 inch neck then the 18 inch Co-Leash is the right size. If your dog’s neck is 19-inches then the 18 inch Co-Leash is still the right size to buy because it will enlarge to fit a 19-inch neck. The Co-Leash will enlarge 3 or 4 inches. Co-Leash products come in a variety of different colors. View available colors in the Online Store. Size 12 inch to 14 inch – Weight 45 to 55 lbs. Fits Springer and Spaniel breeds, Greyhounds, Whippets, Standard Poodles, Afghans, Saluki and many of the same dogs as the 15 inch size. 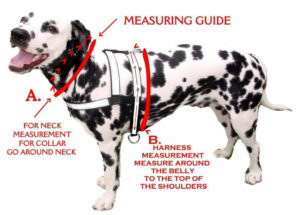 This size works well for tall, thin necked dogs and dogs that reach below the handler’s knee. Size 15 inch to 16 inch – Weight 45 to 55 lbs. Size 18 inch to 20 inch – Weight 55 to 65 lbs. Size 21 inch to 22 inch – Weight 65 to 85 lbs. Size 24 inch to 25 inch – Weight 85 to 100 lbs. Size 26 inch to 28 inch – Weight 100 to 120 lbs. Fits Saint Bernards, Mastiffs, Newfoundlands, and some Pot Bellied Pigs too! The Co-Leash will fit any number of farm animals and can be used equally as well for them. If you have a llama, goat, pig, kangaroo, whatever – and he’s wearing a Co-Leash – send us a picture. We would love to see it and may put it on our web site!